As I took a deep breath, my heart raced and I knew it was time. I was standing on the white line and in moments would be on the other side where everything would change. I said my last prayer, closed my eyes, and walked out of the world for a brief second to only hear the boom drive my mind to the end. 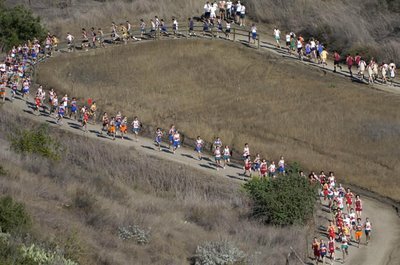 I opened my eyes and got prepared for the biggest meet of cross country, Mount Sac. This course was full of dirt hills, switch backs, and long speedy strides. Before it all started I was surrounded with the joyful screams of all the other teams doing their typical cheers. As soon as I heard the gun shot, my legs moved as fast as I could in order to pack together with my team. Once I lost the discomfort of my breath I was challenged yet with another problem. I looked right next to me as a girl tripped and vigorously dropped to the crispy pavement ground, which caused every other girl to stumble like a domino. Before I knew it I became startled when I saw the ground five inches before me. I slid on the blacktop and felt my whole face flush. My mind went blank for half a second, and then I realized I was racing and my team needed me to continue so that I scored this race. I quickly lifted myself up and tried to hunt my team members to reach them on the other side. While I shifted my mind to the race again I faced the burdensome of the switch backs, which was a hill after a hill after a hill. These first hills made my legs instantly fatigue and full of pain; my body kept telling me to stop, but my mind said keep trying your almost there. With every step I took I perpetually told myself that it was only a step closer to the finish line. Just as I trotted through the last switch back I gently let go of my body as I stumbled down the hill and encountered the cheers from all the other school’s teammates as well as our own. As I pushed my way through the other girls I came across the notorious “poop out” hill; the hill that makes every girl loose motivation to make it to the finish line. It makes your legs sore the minute you start the steepness of it and is where most girls begin to dwindle due to lack of water and strength. Once, I glanced at the hill I reminded myself of all the mileage I had done over summer and all the race pace lappers I did during the year to pace up this hill with a solid motion.